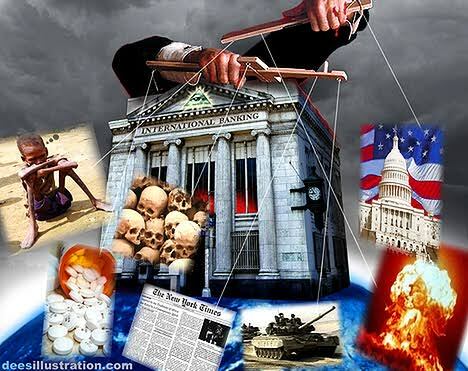 The Federal Reserve was set up in 1913 to finance both sides of two subsequent world wars. In other words, these wars were funded by the credit of the US taxpayer. Apart from profiting from it , the Illuminati bankers use war to enslave us with debt, enact social change and consolidate their power . The Federal Reserve has helped underwrite continued American military expenditures, even after the World Wars. As of 2009, “Defense” accounts for 23% of all American Federal spending. And therefore, the gargantuan size of the American Federal debt is related to the continuation of American military interventions abroad. If we assume that such systems are primarily instruments of war, can we also infer that the World Wars could have been prevented in their absence. Most of us naively assume that the Federal Reserve only underwrote the American war effort. This is not the case. In World War II, the Lend-Lease program was used to ship supplies worth $759 billion to other countries involved in the war. Once we discard the myth that Germany recovered after World War I like a punching doll, it appears that the rearmament of Germany was largely the effort of Americans “investing” the new American dollars produced by the Federal Reserve. One such case is that of the German chemical conglomerate, I.G. Farben, which was central to the rearmament of Germany. It had on its board of directors Paul Warburg, who also sat on the board of the Federal Reserve Bank of New York. Warburg is considered to be the mastermind behind the creation of the Federal Reserve System. Other board members of I.G. Farben also sat on the boards of Ford Motor Company and the Rockefeller-owned Standard Oil. Suspiciously, the main I.G. Farben complex in Germany managed to avoid Allied bombing during the war. War is a profitable enterprise. But the destruction of economies also hampers profits for banks and major commercial entities. An investigation into the motives of The Powers That Be with respect to the World Wars is beyond the scope of this paper. And this aspect cannot be fairly understood while fixating on monetary profit. But if we give credence to fringe historians, we can arrive at some basic conclusions. It could be that monopoly capitalists in the United States, such as J. P. Morgan realized the limitations they faced in the Western world. And so, they decided to expand outside the Western world, creating societies free of the limitations they faced in the West. In both the World Wars, only the Soviet Union made notable territorial acquisitions. While offering a panacea to capitalism, the Soviet system created an unprecedented concentration of power, creating a form of monopoly state capitalism, which was highly favored by The Powers That Be. The Soviet Union may have thus been a modern day colony of “capitalists” based in places like New York and London. Notable capitalists took trips to the Soviet Union as if it were a country club. Since the Soviet Union did not allow private investment, these visitors may have had a direct stake in the Soviet Empire. While the United States spared no effort in creating a military industrial complex to counter the Soviet Union, actual operations against the Soviet Union were half-hearted. For example, the Vietnam War forced many Vietnamese people to ally with the Soviets.